Google Real Time Search Launch! Just few minutes ago, Google launches the Real-Time Search function that feed the content from Twitter, Facebook, Myspace, etc that embed in the Search Result under tab : "Latest Results" that you can see the screenshot following that I just seen it live here. There will be available for more keywords very soon! There are some new updates of Google Algorithms that I would like to summarize as following. Also, Google start showing the site navigation, adding Site Hierarchy into search result. That you need to create a site with clear hierarchy and text links, Create a site map with links to important pages. This is the official caption from Google Blog that will see their continuously improvement of ranking algorithms. To know how successful of social media campaign , you need to get the right measurement metrics that can judge whether is it successful or not. I always use these 5 key metrics in order to measure the social media campaign . You need to monitor the traffic before and after you launch social media campaign, also you can analyze the source of traffic by using your analytics tool such as Google Analytics. 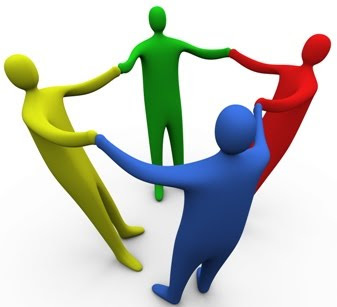 It can know as referral source and also direct traffic and also keyword search as well. You can measure the interaction of social media campaign by using different key measurement , for example : in Twitter, you can use Retweet figure to measure how successful in each message or campaign message that you send out each time. For the blog and also youtube.com , you can see how much people Response / Comment on your post. It will be count both negative , neutral and also positive sentiment. For the sales, if you using the Google analytics tool or other well known tool, you can determine the source of traffic which generated the sales and you can measure the return on investment, conversion rate from each visits compare to other traditional media, search marketing and also display advertising as well. Some website, there is no e-commerce transaction but it is lead generating site. You can use Lead as your major KPI to measure how successful of converting visitor from social media to be prospect buyer (lead). You can use Google Analytics and set up goal for lead in this case. For the engagement measurement, the ideal you can measurement by using average time spent on the site that it is easier to track on the visitors who came from social media campaign (using Google analytics tool). On October 9, Youtube reached the 1 Billion Views of Video a day, there are some interesting information from CEO & Co-Founder , Chad Hurley as following. 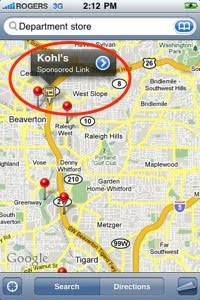 You may noticed the new "Sponsored Link" search results showing up when you search in Google Maps on your iPhone? 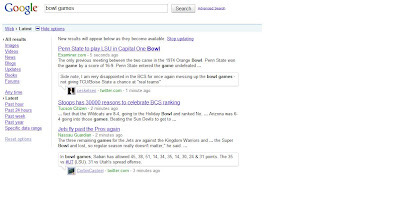 These new search results are Google adwords ads. They're easy to pick out, because they use a customized icon instead of the typical push pin icon. While it's not surprising that Google is going to want to find every way possible to monetize its mapping service, it's still a little disconcerting to see these results popping up. Given this obvious new revenue stream, it makes us wonder whether Apple wants to get in on the lucrative mapping action. Their recent purchase of the mapping service company Placebasecertainly suggests the possibility. That makes the share of Google increase significantly during the last week. I have found one interesting contest. The Ubuntu awards have been announced and its all about ideas for a campaign (online / ofline etc) to run in January / Febuary 2010. The success in the way the elements are linked to provide a 360 degree campaign. The expected return on investment. 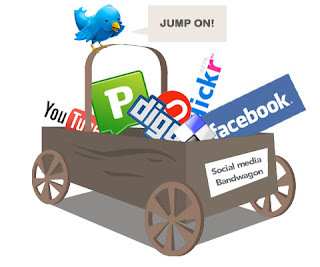 There are some Social Media revolution which significant to our digital life. You can see summarize as following. Years to Reach 50 millions Users: Radio (38 Years), TV (13 Years), Internet (4 Years), iPod (3 Years)…Facebook added 100 million users in less than 9 months…iPhone applications hit 1 billion in 9 months. Who will be next? 80% of Twitter usage is on mobile devices…people update anywhere, anytime…imagine what that means for bad customer experiences? According to Jeff Bezos 35% of book sales on Amazon are for the Kindle when available. 24 of the 25 largest newspapers are experiencing record declines in circulation because we no longer search for the news, the news finds us. 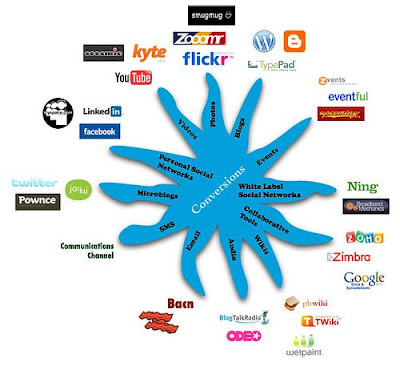 This below is the idea about 10-step for successful social media. You can use this adapt into your campaign. 1. You have to listen to/observe what the target audience is doing in social media. What they interesting / what topic that they most discuss and what website they referring to. brand and of genuine interest. something they can join. We cannot convey the same message to all people, we need to segment it and convey the right message to right people. to your community. Some people love video, some people crazy in photo, we can let them what they prefer that will give them unlimited ideas. 5. Make the experience better when shared. Make the people feel good experience when they are engaging, don't make them fear , such as over-throw messages and some scam things. 6. Optimise your content for sharing—particularly via newsfeeds and Twitter. To be remember that, Newsfeed and Twitter, people pull information, if there are lot of content which duplicated or not interesting, people will stop pulling that and you will loss that group of people. 7 . Use paid-for media to get the ball rolling. Advertising & PR will help pushing the campaign and let people aware of the campaign message. It should be integrated communication, most important thing, it must be the same big idea as social media that people will interest in one topic. 8. Take advantage of extreme targeting offered by social networks. 9. Make sure you have the resources to manage your community management and refresh the content. 10. Track the results and optimise. It is most important thing to do that you will measure how effective of campaign when you run the social media campaign. I have found this presentation of Eye Tracking Study in 2009 , that focus on Social Website like Facebook, Twitter, Youtube.com that we can see how user behavior when they are using social media site. For this research , It will answer you this question. 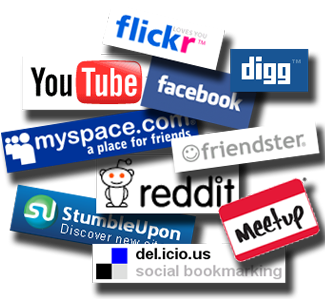 "Will people click the ads in social networking sites? - The study found that 65% of participants engaged with sponsored ads within the first 10 seconds of their search. - Scan paths do not follow the order of the search result positions. Often, sponsored ads were looked at before the third or fourth result. - There is not a significant difference in fixation duration across the first four results or sponsored ads on both Facebook and YouTube. - 50% of participants were satisfied with their brand search on Twitter. Many liked that they could find the most current opinions about a product. Yesterday (Wednesday) it is another big day of Internet Industry as Microsoft & Yahoo set up conference call to announce the deal. It is 10-year deal gives Microsoft its best shot yet to show its new search technology, Bing, is as good as or better than Google's. Microsoft also hopes to use Yahoo to divert sales from Google, which generates more than $20 billion a year from ads. During the first five years of the deal, Yahoo! will get to keep 88-percent of the ad revenue from its own search sites and will be able to sell ads on certain Microsoft Web sites, as well, becoming the exclusive force behind Microsoft's advertising sales initiatives. For this deal , Microsoft will gain access to Yahoo's audience would instantly more than triple Bing's U.S. market share to 28 percent. That's still a far from the remarkable 65 percent of U.S. searches handled by Google, according to the research firm comScore Inc. This deal will make the cons to Yahoo as Yahoo will have limited access to the data on users' searches, which yield insights that can be used to pick out ads more likely to pique a person's interest. The value of that information is why Microsoft wants to process more search requests. 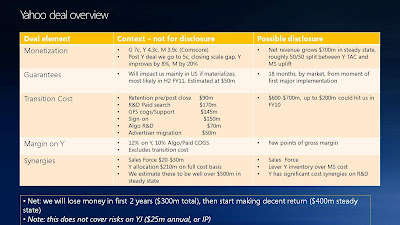 You can also view what will be about Yahoo Deal overview shown below. 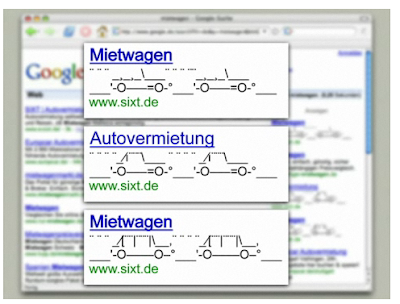 I also found funny logo about this search deal as well. Today I have found the creativity idea of 1-800-FLOWERS.COM which set up the store front page in Special Offer page in Facebook. If you are not the Fan yet, it will look like this image that you can see only feature product and leads to their website. Then, I click to become a Fan of 1-800-Flowers.com , then I see the page has been changed to this . That's cool! That we can interact to product without leaving facebook. 1-800-FLOWERS.COM has teamed up with ad network / app developer Alvenda to bring its store to a potentially massive audience on Facebook (although only some 1530 people have become a fan of the florist shop’s Page so far). 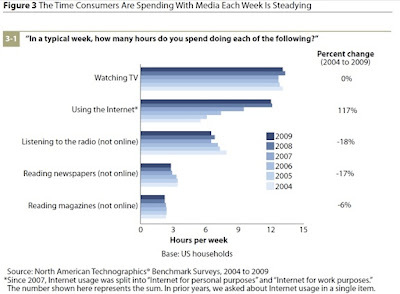 There are some interesting about perception from Men and Women of the social media and online media consumption. I have found some interesting information as following. - Men on Twitter would always write a statement. Women have a larger tendency to ask a question or to convey a feeling that draws empathy or compassion. - 63 per cent of Facebook users are men, with a growing membership of women, aged above 55. - Andrew Robertson of BBDO said there are three fundamental differences between men and women. Men are more about scoring, fantasy and destination. "This is why, men enjoy online games much more than women. In fact, 84 per cent of virtual reality players are men." - 63 per cent of women in the UK complain that men spend too much time playing online games. I just read " "The Traveler's Road to Decision," released from Google and OTX on Tuesday, there are some interesting point that I would summarize as following. 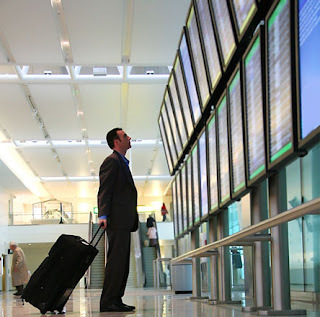 - Business travelers are more likely to seek out money-saving packages, access travel sites from their mobile phone, and become a rewards travel program member. - 25% of business travelers are more likely to access information on their phone, and 83% of business travelers belong to a rewards program. 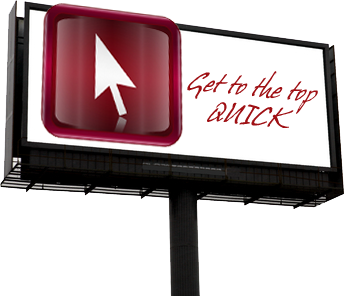 - Most Search advertisers still don't share the message of specific rewards programs in search campaign yet. 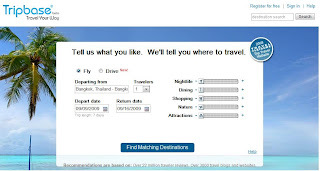 - Google found research to booking could stretch as far as 18.1 weeks on average. That's when more generic phrases are searched on. - When consumers looking information about hotels, 81% rely on search engines when looking for business overnight accommodations vs. 67% personal; 74% business air travel vs. 59%; 60% destinations vs. 59% personal; and 51% vacation activities vs. 55% personal. 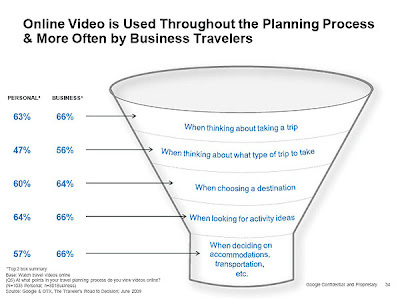 - Travel videos have also become important as people plan trips. Wow, that's cool!. Amazon announced today to acquire apparel and footwear retailer Zappos.com for $847 Millon. Zappos, the popular online retailer ranked 3rd last week among online retailers within the Apparel and Accessories category behind Victoria’s Secret and Old Navy. Both Amazon and Zappos.com are well-known for the breadth of product offerings, so it is not surprising that they share much of their audiences. The deal would be the most expensive purchase in Amazon's recent history, according to FactSet Research. Amazon's priciest acquisition this decade was Audible Inc. - which provided audio editions of books and newspapers - for $ 280.7 million cash in early 2008, according to FactSet. Zappos is one of company that utilize huge effort to social media that they make their customers feel warms, I think Amazon may adapt and utilize from those channels as well. The target group of Amazon & Zappos is nearly same target that you can see figure above. It quite interesting to develop some market to senior citizens in USA. The 70-75 year old age bracket is one of the fastest-growing segments of the online population, according to the Pew Center for the Internet and American Life. 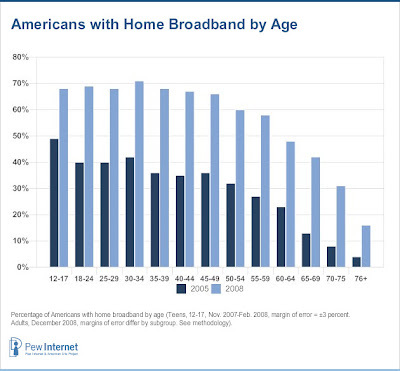 In 2005, 25 percent of them used the Internet. Last year, 45 percent went online. Older surfers use the Web primarily for searches for things such as health information, e-mail, and buying products. I just found the new research from Forrester about projection of the Internet population will hit 2.2 billion people by 2013. 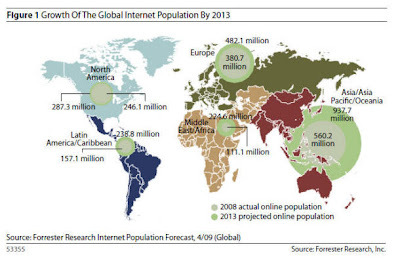 Of that tally, 43 percent of the Internet population will be in Asia. There are some interesting points in the the research paper as following. • 17 percent of the online population will reside in China. Tha'ts really big market. 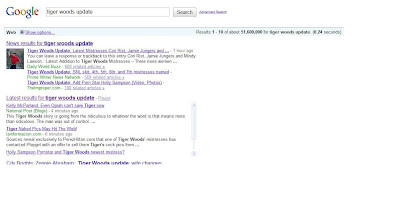 The search engine war between Baidu VS Google. • Growth rates in the U.S., Western Europe and other industrialized nations will be between 1 percent and 3 percent. • Online penetration in the U.S. will rise to 82 percent in 2013, up from 73 percent. That rate will put it on par with other Internet saturated countries. • Russia and Turkey growth will grow 8 percent a year. • Africa and the Middle East will show strong growth to hit 13 percent of the online population in 2013. Search continues to lead interactive spend followed by display. I have just read about the trend report from Forrester about Interactive Marketing industry will reach $55 Billion dollars, There are some interesting point as following. - Search continues to lead interactive spend followed by display. - Social media assets (like internal blogs, community sites) are really the only emerging media getting traction in today's economic climate. But anyway overall advertising budgets will decline. With dollars moving out of traditional media toward less expensive and more efficient interactive tools, marketers will actually need less money to accomplish their current advertising goals. Google reported revenues of $5.52 billion in the second quarter of 2009, representing a 3% increase over second quarter 2008 revenues of $5.37 billion. Google Sites Revenues – Google-owned sites generated revenues of $3.65 billion, or 66% of total revenues, in the second quarter of 2009. This represents a 3% increase over second quarter 2008 revenues of $3.53 billion. Google Network Revenues – Google’s partner sites generated revenues, through AdSense programs, of $1.68 billion, or 31% of total revenues, in the second quarter of 2009. This represents a 2% increase from second quarter 2008 network revenues of $1.66 billion. International Revenues – Revenues from outside of the United States totaled $2.91 billion, representing 53% of total revenues in the second quarter of 2009, compared to 52% in the first quarter of 2009 and second quarter of 2008. Revenues from the United Kingdom totaled $715 million, representing 13% of revenues in the second quarter of 2009, compared to 14% in the second quarter of 2008. Paid Clicks – Aggregate paid clicks, which include clicks related to ads served on Google sites and the sites of AdSense partners, increased approximately 15% over the second quarter of 2008 and decreased approximately 2% over the first quarter of 2009. Cost-Per-Click – Average cost-per-click, which includes clicks related to ads served on Google sites and the sites of AdSense partners, decreased approximately 13% over the second quarter of 2008 and increased approximately 5% over the first quarter of 2009. TAC - Traffic Acquisition Costs, the portion of revenues shared with Google’s partners, decreased to $1.45 billion in the second quarter of 2009, compared to TAC of $1.47 billion in the second quarter of 2008 TAC as a percentage of advertising revenues was 27% in the second quarter of 2009, compared to 28% in the second quarter of 2008. The majority of TAC is related to amounts ultimately paid to our AdSense partners, which totaled $1.24 billion in the second quarter of 2009. TAC also includes amounts ultimately paid to certain distribution partners and others who direct traffic to our website, which totaled $218 million in the second quarter of 2009. Elle becomes the powerful girl in Youtube and Social Network now that she build the great community via Youtube and other social network sites. 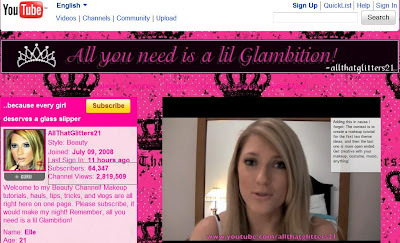 She now got almost 3 Million Channel Views with more than 64,o00 Subscribers in her channel. Elle , 21 years old running her own Beauty Channel that cover the makeup tutorials, hauls , tips and tricks and video blogs. This below is info from her profile. She uses many ways to connect with her target group to get update information via Facebook and Twitter. She has more than 11,500 followers in Twitter account. She also running the contest via her channel as well. This kind of thing is really interesting and you can see how powerful if we use it in the right way. Let come to see what Bill Gates said about Google Chrome, which he just recently interviewed with CNET. "There's many, many forms of Linux operating systems out there and packaged in different ways and booted in different ways,"
"In some ways I am surprised people are acting like there's something new. I mean, you've got Android running on Netbooks. It's got a browser in it." Gates said it was hard to really say much about Chrome OS, since Google has said so little about how it will actually work. "The more vague they are, the more interesting it is," he said. 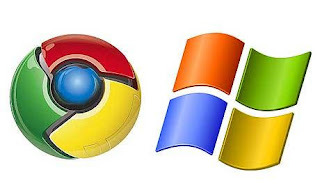 Steve Ballmer and Bill Gates also stressed the fact that Google now has two operating systems--Chrome OS and Android. Steve Ballmer noted that Microsoft learned with the separate Windows 95 for consumers and Windows NT for businesses that having two operating systems isn't necessarily a positive thing. In one of the latest reports by Hitwise for search engine share data, Bing showed significant growth almost every week. You can also see data from different source which also claim huge growth of Bing as well. 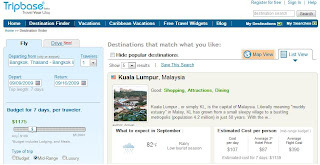 In Addition, Bing Maps (Bing.com/Maps), now become the top 20 travel website rank which recorded by Hitwise (June) which jump from #7629 in May 2009, to #17 now. You will not surprise who will be the winner of this year Cannes Lion Awards for Digital Campaign. The winner of Cyber Grand Prix (Cannes Lions 2009) is Tourism Queensland: Best Job In The World , which every known about this campaign. Let's see what is details inside of this campaign. The target audience were new customers, with a vague awareness of the Great Barrier Reef (and Australia), but no awareness of the islands. Our goal was to raise internationalawareness of the Islands of the Great Barrier Reef (a new brand for Tourism Queensland) and transform a popular day-trip destination into an international tourist’s dream holiday. Classified press ads, a PR campaign, in-store posters, online recruitment listings and display ads worked together to drive traffic to the website. Visiting and engaging with the website would drive visitation to the islands in the long term. The best aspect of ‘The Best Job in the World’ is its location, and although the generous salary is appealing, the real reward is in spending six months living above the reef and exploring the region. The ‘Best Job in the World’ idea was born out of the brand’s positioning – Life Above and provokes Global Experience Seekers to engage with a unique brand asset – the Great Barrier Reef. This would be one of the only integrated international recruitment campaigns, and the only recruitment campaign used to launch a tourism brand. We tapped into a universal desire and created a job that sounded too good to be true - anyone from anywhere in the world could apply. 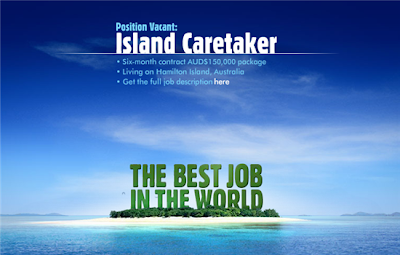 The Islands Caretaker role is a completely genuine employment opportunity within Tourism Queensland, living on the Islands of the Great Barrier Reef and reporting back to the world. To apply, candidates had to create a persuasive and entertaining video application demonstrating their knowledge of the region. Tourism Queensland wanted to achieve 14,000 application videos from 8 key markets, plus news coverage in mass media and popular social networking sites. Describe the results in as much detail as possible. No single tourism campaign (and potentially no single campaign) has ever had such a significant global reach across the spectrum of media and generated such a high volume and highly impassioned response from consumers. -34,684 applicants from 201* countries created 610 hours of video content which passionately promotes our product. - Over 450,000 votes for the Wild Card applicant. - In 56 days islandreefjob.com had 6,849,504 visits, 47,548,514 page views with an average of 8.62 minutes spent on the site. - Media coverage has been estimated at over $US100M from a campaign budget of $US1.2M. *Value of media coverage estimated by Tourism Queensland, as at 19/3/09. **Web-coded countries (only 195 countries are recognised by the UN). 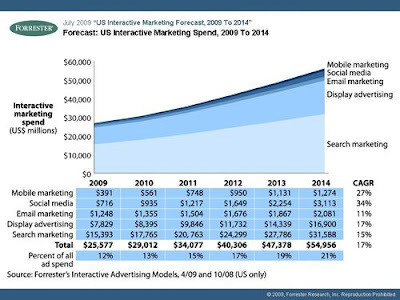 Interactive will reach 21% by 2014, Social Media is Biggest Growth! I just read the recent research paper from Forrester Research about the growth of Interactive Marketing. There are some interesting points that I would brief as following. - Marketers will not expand the marketing budget but will shift to interactive marketing, such as social media, mobile marketing, and search and e-mail marketing and display ads. 1. Estimate the amount of revenue you expect to make in one month. You need to use minimum amount of revenue that you can stay in the business. Worst case scenario of estimation! 2. Guess at your close rate, for every 100 leads , how much you thinks that you can convert them into customers or transaction. 10% is quite fairly conservative. You will get better of number when you run a new product for a while. 3. Use your estimate close rate to estimate how many leads that you need to be breakeven or reach the minimum number of sales. 4. Calculate your target CPL . I think you talk with other people to get feedback and some comment what your thought. 5. Multiply the number of leads by the Target CPL . You will get how much you will have to spend per month to buy the leads you need. For example, you want to sell 100 transaction per month. You have 50% close rate, you need 200 leds to sell 100 transactions. If the target CPL is $10 and you need 200 leads, you will need to spent about $2000 per month. Now, you got the idea what is PPC Budget for your new product. I got the recent news about PepsiCo appointed Microsoft to run the biggest ever online campaign, that's so exciting. The campaign will run for nine months and will initially include a Pepsi Max microsite in the UK, Norway and Australia targeting 18 to 25-year-old men. They have aim to engage users with the brand by allowing them to share comments, games and photo galleries with friends on social networking sites such as Facebook and Twitter, encouraging them to join Pepsi Max's Club.Microsoft's portal MSN will host specially created editorial content, which Microsoft has guaranteed will drive at least one million people to the micro site. Microsoft Advertising will also drive consumers to the microsite through ads around its MSN Messenger service. 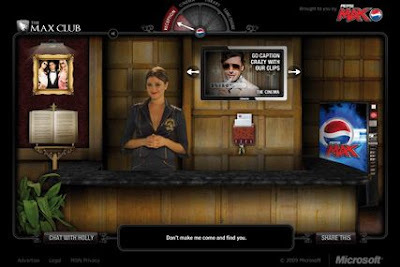 The Pepsi Max's "Club" microsite has been built and is being hosted using Microsoft technology.